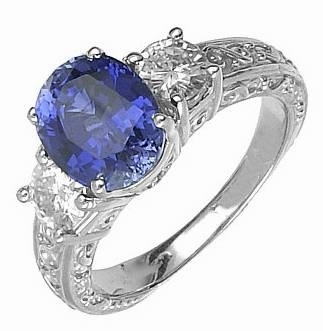 The Benton Clearance 1.5 Carat Cubic Zirconia Oval Lab Created Sapphire Three Stone Estate Style Ring features a 1.5 carat 9x7mm oval man made sapphire blue center stone with .75 carat 6mm cubic zirconia rounds on either side. A plethora of engraved details will amaze anyone who wears it and admires it. The man made sapphire oval center stone is coupled with the finest hand cut and hand polished original Russian formula diamond quality cubic zirconia. Available in 14k white gold and center stone color options include man made ruby, sapphire or emerald, in addition to pink, canary or diamond look simulated cubic zirconia. For further assistance, please contact us directly at 1-866-942-6663 or visit us via live chat and speak with a knowledgeable representative.